Do you want to transmit status and commands remotely without programming and mapping? When I first got exposed to the Radioline a few months back, the first thought was why this innovative product was not launched six to seven years back. Back then I was with another company working on a project which involves collection of water from wells, sending it to the treatment plant; then redistribution of the treated water to storage tanks. The application is simple enough, only simple logic no doubt – just monitoring of tanks levels and starting or stopping pumps. However, the wells and storage tanks are spread across a wide area, PLCs coupled with radio modems are required to transmit status like tanks level to the main PLC and commands from the main PLC to the centralized motor control centre to control pumps. The integration of the PLC from manufacturer A and Radio Modem from manufacturer B using protocol C is almost a nightmare. First the PLC to PLC communication is tested based on protocol C before including the Radio Modem. Messaging instructions has to be tested and correct IO mapping between PLCs checked which was not too difficult. Next testing with the Radio Modem, it did not work no matter how hard we tried. After checking with the manufacturer, a firmware update it needed to support Protocol C; so not all radio modems and PLCs are compatible as the protocol used may not be supported by the algorithm used by the radio modem. Fortunately I did a check before purchasing – so still no big shakes. The real pain is during site installation, things get a bit complicated, as there were quite a number of remote locations. The modems have their own address and the PLCs have another set of address making things quite messy and at times confusing when the stress sets in. Polling time adjustments have to be done in the PLC and also in the radio modem. A laptop has to be lugged around to check the signal strength and the mapping in the PLC. All these hassle and loss of time would have been eliminated if Radioline has been available then. Radioline is a radio modem that comes with expandable IO modules, input modules take in the field signal at remote locations and send them to the main station. 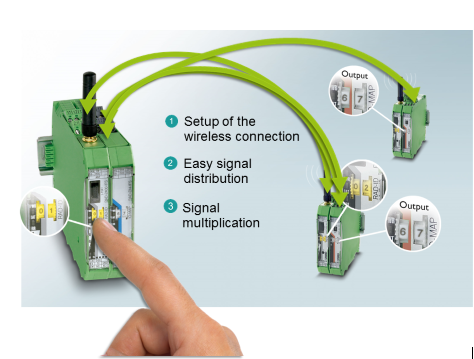 These signals can then be send to the PLC via output modules or Modbus RTU. No software programming or mapping is needed; all these are done through a turn of a dial (See picture below). For my application, the Radioline can replace the PLCs at the remote locations transmitting signals back to the main PLC. To start or stop a pump, the PLC can send an output to the Radioline input modules which will trigger an output module at the remote motor control centre starting or stopping the pump. Isn’t this much neater and easier? No more messaging instructions, no more IO mapping to check and no more laptop to carry around as the Radioline has a indication bar on the hardware showing signal strength and configuration is all through a dial. In addition, the footprint of the Radioline is so much smaller; a smaller box could be used saving some cost as the outdoor GRP boxes are not cheap. Too bad I did not have the luck to enjoy a easier life previously but I do hope Radioline can help make things easier for others! Chin Hui is responsible for Solutions Marketing in Phoenix Contact SEA. He also takes care of the Automation product range.